An intriguing picture of life during the Civil War, through the newspapers of the period. 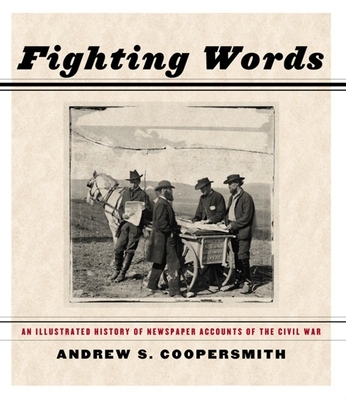 Delving into an untapped source to tell the story of the Civil War from an entirely new and fascinating perspective, Fighting Words provides a sweeping history of the conflict through colorful, idiosyncratic, and highly opinionated newspaper accounts from all sides of the conflict. A panorama-in-print of a fractious and frenzied nation through articles, editorials, and illustrations culled from more than eighty Civil War--era newspapers, most with markedly different agendas, Fighting Words is the perfect gift for Civil War buffs. Coopersmith's innovative new study is a reminder of the way in which, then as now, our understanding of the world is shaped by and powerfully reflected in the media. Lavishly illustrated with more than one hundred facsimile reproductions from the newspapers themselves, many never before available to a contemporary audience, Fighting Words includes accounts of such events as the capture and occupation of New Orleans, the drive toward emancipation, the enlistment of black soldiers, the New York City draft riots, class conflict in the Confederacy, and the assassination of President Lincoln. Educational and entertaining, rousing and often contradictory, it reveals the vastly different priorities, worldviews, and political objectives that shaped the war and its outcome.